This is the story of Dr. Monticore VonBraun, his family, and their unfortunate experiences with the house known as the "Rebel Yell". Monticore VonBraun was a brilliant scientist and psychiatrist, renowned as a genius for his treatments of depression and other mental illnesses. Respected by his peers and his patients, he was often celebrated in the news media of the day for his revolutionary processes and ideas. His many friends knew him as "Doc" or "Monty". In the later years of his career however, Doc's experimental electroshock treatments and disregard for traditional psychiatric practices often drew scathing criticism. It was these troubled, later years that led Monty to the Rebel Yell. However, soon after the Doc & his family moved in to Rebel Hill, things began to fall apart. Monty's children, Eisenhower and Rose, became withdrawn and often sat in corners talking to themselves. His wife, Amelia, became more and more neurotic and the Doc himself began to see terrible visions of tortured souls all over the house. The disconsolate spirits leaking from the morgue in the basement and the adjacent graveyard continued to wreak havoc on the poor doctor and his family. Eisenhower and Rose became more withdrawn, Doc's work became increasingly sinister and Amelia's depression grew worse. Late one October 31st, Doc was taking a rare break from his work and having dinner with Amelia in the dinning room. He was trying to comfort her with tales of his latest breakthroughs, but she would only sob and gently stab her hand with her fork. Suddenly they heard a blood curdling scream coming from the lab. They rushed into the lab to find Eisenhower and Rose dead. They had been electrocuted when one of Doc's machines was activated by a freak lightning strike. While Doc tried in vain to resuscitate them, Amelia quietly left the room, dragged a chair and a rope down the hall to the children's bedroom, and hung herself. The doctor shifted his research to a new purpose. Spurred on by relentless voices in his head and ghostly visions of his family, he now believed he could bring the dead back to life and prolong that life indefinitely. He devised a process of injecting bodies with ectoplasm collected from spirits in the mortuary graveyard and basement, then jolting the corpses back to life with electrocution. The first Rebel Yell was held on Halloween night, 2000. For several years prior, I had been organizing and building haunted houses with the YMCA Leader's Club in Saratoga and the Los Gatos Rec Department. Each year I would add a few more props and costumes to my collection, along with lights and sound equipment from my Mobile DJ service. The haunts I worked on in those early years were usually pretty well received, but poorly attended. On Halloween night most years, I would also construct a graveyard scene in my front yard where my friend Ernie and I would hide out and scare TOT's. 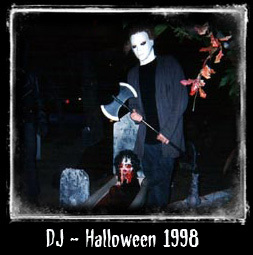 In 1999, I had started a new full time job and I realized that the haunt I had organized at the Los Gatos Youth Park that year would have to be my last "big" haunt for a while. I decided that the following year I would focus on expanding the graveyard scene at home into a walk-through haunted house. I recruited Ernie and some other friends to help out, and we started planning about a month before Halloween. We decided to use the driveway, garage, and side yard, and keep a small graveyard scene on the front lawn. It was a lot of work, but we had more time to work on things since we all lived nearby and were building at home. Although we forgot to plan some important details, like how we were going to build the walls, everything came together just in time. I think we had about 175 people come through that year. It was more folks than we expected, probably because we already had a bit of a following since we'd been haunting the yard for so many years. We didn't have an official name or much of a theme in the beginning. The first Rebel Yell, creatively titled "Haunted House", went something like this: Our victims entered through the graveyard, then were chased by a guy with a chainsaw who came out of a scary storage shed "crypt". From there they entered a dungeon sort of room, then a hallway with strange lights and then a room full of spiders. The last room was sort of a human butcher shop with lots of body parts and dripping blood. I've always liked the effect of using pumps and red-colored water to make blood drip off of tables, out of bodies and generally just squirt all over the place, so this was my favorite room. In recent years these effects have been incorporated into our Bathroom scene which Haunted Bay described as "especially nauseating". For our second year, we added a dining room and a Pepper's Ghost effect. In 2002 we named the haunt. I suggested we incorporate the name of our street, "Rebel Way", into the name and Ernie came up with Rebel Yell. That year we also built a new frame and walls for the driveway, and added a bathroom, kitchen and bedroom. 2003 saw the addition of the Laboratory and in 2005 we wrote the back story (above) to help us with the theming of the rooms and scenes. Our peak attendance for our home-haunt on Rebel Way is around 700 people, which is pretty good considering we never do any promotion (other than this Website and our Facebook page). 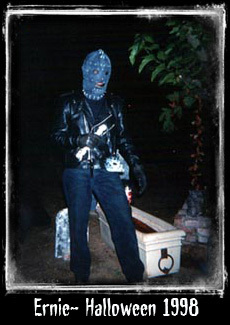 We never charged admission for the home-haunt, but in 2002 we did start asking for donations. Most people paid the suggested donation of $2, and a few folks pitched in more. In 2005 we gave all of the collected donations to the Red Cross for their Hurricane Katrina relief fund. Since then, we have upped the suggested donation to $5 and give at least 50% to charity. Recent beneficiaries have included the Movember Foundation and Red Cross California Wildfires Relief Fund. In 2018 we will be making a donation to Angels On Stage. For our 2007 season, the Rebel Yell went "pro" and joined with the nationally famous Pirates Of Emerson and four other haunted attractions to form The Haunting Fields. We had been wanting to try our hand at a professional, open-to-the-public, paid-admission haunt, and this was the perfect opportunity for us. We spent many months and many dollars planning and building a Rebel Yell that was bigger and better than ever before. It was more work and more fun and more exhausting and more rewarding than anything I have ever done. It almost killed me. And I loved it. Admission to the Haunting Fields was $20 for five attractions: Pirates Of Emerson (1 haunt and a chain link maze), A Ghoul's Night from Fresno (2 haunts), Heartstoppers Haunted House from Sacramento, and Rebel Yell. We had thousands of visitors and it was an amazing experience we will never forget. Rebel Yell took the 2008 season off, and I did a little yard haunt like back in the day. In 2009, we returned to Rebel Way. Will the Rebel Yell do another Pro haunt one of these days? That's a solid "maybe". Since we started the 'Yell nineteen years ago (!) we have visited many other haunted attractions, dark rides, theme park Halloween events, and trade shows. Our favorite haunts have always been those with a consistent theme and story, original music and characters, lots of detail in the scenes, and scares that come from unexpected places. There was a time when you would find chainsaws and Freddy Krueger masks in our haunt, but these days we strive to tell our own story and give people something they haven't seen before. I haven't talked much here about all of the actors, builders, artists and designers that have worked with the Rebel Yell over the years, mainly because there are so many of them and I could go on for days about all they have done. I'll just say that we have been fortunate to work with some very talented, dedicated, delightfully twisted people and the Rebel Yell would not exist today if not for their hard work. It always amazes me how many like minded haunt junkies there are out there and how much they are willing to give of themselves to make something great. Thanks guys.